Another attempt to make homebrew compact, cheap and easy hits Kickstarter. Brewing your own beer is surprisingly easy and cheap. But, it can seem intimidating. Plus, some of the equipment takes up a lot of space if you really start to embrace the hobby. Companies like Picobrew have been trying to simplify the process to make it more appealing to newcomers and those with limited space. The Pico Model C is the latest in a line of "countertop" brewing machines. It looks more like a coffee machine than anything else. In fact, it looks a lot like the company's previous machine -- the Pico -- except the stainless-steel body has been replaced with a black powder-coated finish. That change in materials, though, is a pretty big deal. By ditching the expensive stainless steel, large OLED and traditional ball-lock keg, Picobrew has gotten the price down to $549 from $800. Hell, if you grab one of the early bird Kickstarter specials, the Model C will only cost you $279. It's still not exactly an impulse purchase (and a far cry from the $50-$100 a stovetop starter brewing kit will set you back), but it's definitely a huge improvement for those who are still unsure about how much they want to invest in a new hobby. In place of a more traditional keg, Picobrew is including a custom-made fermentation vessel it calls the Pico C Keg. It's basically just a stainless-steel pot with a lid that latches on like a pressure cooker. Instead of using common ball-lock connectors, simple color-coded hoses run from the machine to the keg. While connecting ball locks isn't exactly rocket science, the Pico C Keg is much easier to hook up and clean than the common Cornelius keg. You can even stick it in the dishwasher if you want. More interesting, though, is the new app called BrewPulse. It's still clearly in the very early stages of development, but the app should help brewing newbies. BrewPulse doesn't control your Pico, to be clear. Instead, it's focused on tracking and instruction. It walks you through every step, starting with ordering PicoPaks -- prepackaged pods of grain and hops that you simply insert into the machine. The reader inside scans an RFID tag on the pack and downloads the recipe to the machine. From here the app tracks the whole process, monitoring fermentation temperatures and which beers are where in the pipeline -- which are waiting to be made, which are brewing, which are fermenting, carbonating or being served. Basically, it's a homebrew inventory system. It's kind of the perfect partner for the company's new BrewUnlimited subscription service that's also launching. Think of it like Netflix for PicoPaks -- $59 a month gets you as many kits as you can brew in a month, though you're limited to two unbrewed packs at a time. The Model C, of course, has its limitations. Basically the same as the Pico before it, it makes only 5 liters (slightly less than 1.5 gallons) of beer at a time, which is fine for poker night or a small dinner party, but it's not gonna be enough for a big barbecue. The other is flexibility. The focus on simplifying the process means limiting the number of variables, especially on the machine itself. You can create customized recipes using the FreeStyle PicoPak tool on the company's website. But, once the pack is in the machine you can only adjust the ABV and bitterness. 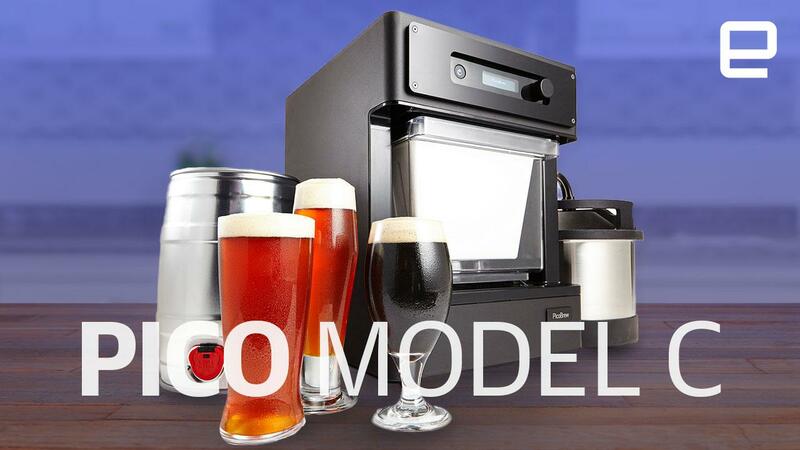 At $279, the Pico Model C doesn't seem to be a bad introduction to the world of homebrew if your primary concerns are convenience and space. At $549, the value proposition becomes less clear, especially considering some of its limitations. But we'll reserve judgment until we have a chance to spend more time with a production model, which should be shipping some time this fall. Update: And Picrobrew blew past its fundraising goal in less than eight hours. So, if you pledged your hard earned cash for a Model C you should be getting one by the fall.